DE-CIX is a provider of premium Internet Exchange services to all kinds of networks and operates several carrier-neutral and independent Internet Exchange Points (IXPs) in the world, including DE-CIX Frankfurt, the world’s largest IXP. Founded in 1995, DE-CIX has established an environment for the bilateral settlement-free exchange of Internet traffic, called peering, between all types of Internet service providers (ISPs) including broadband and content providers. Originally started as a project founded by three German ISPs, DE-CIX Frankfurt is now the largest Internet Exchange Point in the heart of Europe. Today, DE-CIX has about 800 customers from 60+ nations using peering to lower costs, reduce latency, and increase IP performance and resilience. By serving customers in all major data centre facilities at our Internet Exchange Points, we enhance our customer’s ability to expand their business and exchange Internet traffic with more networks than anyone else – efficiently and securely. In addition to Frankfurt, DE-CIX operates Internet Exchange Points in Hamburg, Munich, New York and Dubai and offers additional IX services. And more Internet Exchanges and IX services will be established. 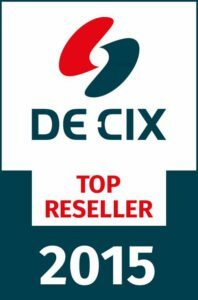 IX Reach has connected more than 50 customers to DE-CIX Frankfurt itself and is their first official reseller in Madrid.